While direct mail is one of the most expensive methods of lead generation it is so popular because it is dependable and gets results. The process of creating a direct mail lead campaign involves multiple steps which an agent can do in its entirety or on a piece meal basis. We’re going to break down the steps involved and throw in a few tips along the way. Before diving into content and design you need to decide if you want to send a letter or postcard. Both are very popular and are handled in slightly different ways. Most agents write their own marketing copy but if that isn’t your area of specialty you might want to consider hiring a copywriter to maximize your efforts. Professional appearance tends to get a higher response rate which is why some agents elect to include a design or logo on their post card or letter mailings. Freelance sites such as Upwork.com are great sources for copywriters and graphic artists. For logos we prefer 99Designs.com. Many print services will also offer design templates as well as custom designs. The supply and printing options for a direct mail campaign can be handled in various ways. Some agents elect to get bulk supplies from their local office supply house and fire up the personal printer. While this can be effective it is time consuming and rarely turns out as well as having it professionally done. When you take the time and expense to manage a direct mail campaign we recommend outsourcing the envelope and postcard printing to a professional service. There are many available locally or online and when dealing in bulk it will normally prove out to be the most cost effective option. Postage options vary depending on the size of your mailing and can range from a using an everyday postage stamp to renting postage meters and folding machinery from a company like Pitney Bowes. Many agents fall somewhere in between and for this the best solution we have found is Stamps.com. Stamps.com offers flexibility and customization with printing postage on your envelopes in house for a reasonable monthly fee. The service offers a free digital scale and program software and is the ideal option for most independent agent direct mail campaigns. Tip: Handwriting the prospect’s address on letters and envelopes gives the impression of personalization and extra effort. We’ve found mailings with handwritten addresses to have a higher response rate. We recommend using a local service if using this option. As with postage this aspect can vary depending on mailing size and available resources. Most large mailers own or rent automated folding and stuffing mailroom equipment. We recommend every agent try an in-house direct mail campaign as well as using a turnkey direct mail lead generation service to compare costs and overall value. The costs of direct mailings are high and there is a certain skill level required to pull off a great campaign. It is a lot of work and it isn’t for every agent. 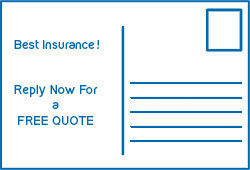 Also Checkout Out: Our direct mail insurance leads page here.